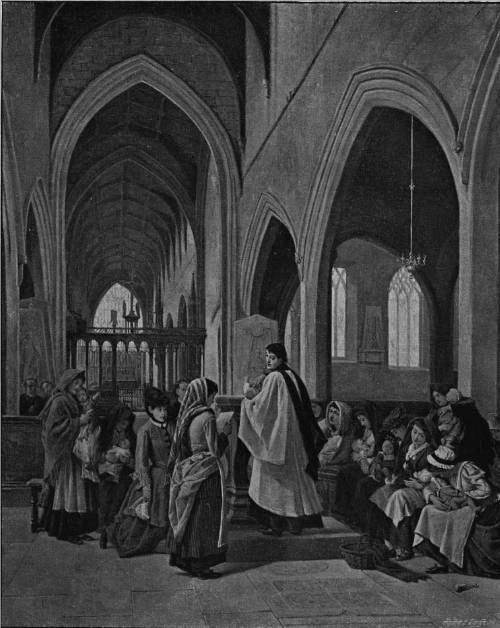 This painting actually began life as a sketch of a group of people attending a baptism in St Paul’s parish church in Sheffield. Crowe made his first composition in September 1894, but altered the background to that of Newcastle in December. In A Baptism in the Cathedral of Newcastle-on-Tyne (540), a young mother has brought her first-born to the font, and waits her turn for the ceremony. A girl in front, who reads the responses to the prayers of the clergyman, is very well portrayed, and characteristic and suitable incidents abound. The figures are certainly the best part of a picture which suffers from the rather cold and monotonous treatment and opacity of the architecture. …a disappointing work containing few elements of charm.